If you organise your photos by folders and find this perfectly satisfactory, then you can use any number of different programs to keep your images organised. Adobe Bridge is a good starting point as an image browser if you already have Photoshop, and ON1 Photo RAW and Alien Skin Exposure are two examples of all-in-one programs that have image browser tools built in. But sometimes this isn’t enough and you need to be able to organise and search images in a much more flexible way. For example, what if you need to find all your images relating to snowboarding, or Provence? If you’re lucky these might be in just a couple of different folders and you’ll know where to find them. More likely, they’ll be spread across a whole series of different folders containing pictures taken at different times. And if you want to find all images taken with a certain lens at a specific aperture, say, then you’re definitely going to need some kind of cross-folder cataloguing tool. These work by importing all your images into a database which essentially contains a preview of the image and a link to the original file – you don’t have to move your images to import them into the database, or ‘catalog’, which means you can still keep your original filing system. ON1 Photo RAW and Corel AfterShot (not reviewed) employ a kind of hybrid system where you can browse folders without importing them. They make a big play on this ‘no need to import’ feature, but it’s a bit of a hollow claim because you still need to import or ‘index’ folders to get the full range of search tools. Other programs, like Adobe Bridge, make no real attempt at cross-folder searches. Bridge can do it, after a fashion, with its own Collections and Smart Collections, but its Collections are stored as a single linear list and cross-folder searches can be hopelessly slow. This is a pretty clear winner, and for a number of reasons, mostly related to cost and convenience rather than outright quality. Lightroom’s cataloguing tools aren’t perfect, but they do the job, and as well as browsing your images by folder (once they’re imported), you can create Collections (albums), Smart Collections and Collection Sets to store them in – these are like folders for Collections. Lightroom has a substantial price advantage. If you buy Lightroom 6 on a perpetual licence it’s around one-third the price of Capture One Pro, and if you get Lightroom CC as part of the Creative Cloud Photography plan you get both Lightroom and Photoshop for around £10/$10 per month. Lightroom’s other advantage is the breadth of its camera support. Adobe is quick to release updates for new camera RAW formats and supports a wide range of low-end consumer cameras as well as premium and professional models. There’s a final, very important factor. 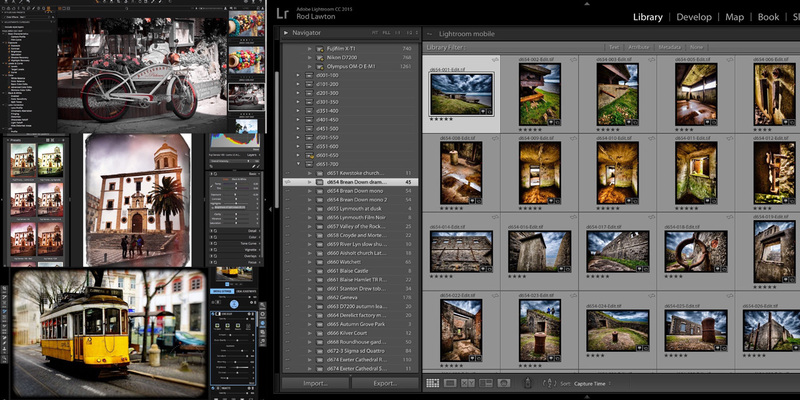 Lightroom CC works with Creative Cloud and Lightroom Mobile to provide synchronised image editing and capture across all your devices, including web browsers, tablets and smartphones, and not just in the desktop application. Depending on how you like to work, that could be a deal-breaker. I’ve put Capture One Pro in second place principally for reasons of cost and convenience again. It costs a lot more than Lightroom to buy a license outright, and while Phase One does now offer a subscription program like Adobe’s, it’s twice the price and you only get one application not two. And although Phase One is pretty fast at issuing updates for new cameras, its focus is more on the enthusiast/high-end market. Both programs offer automatic lens corrections via automatically updated lens correction profiles, and the pattern is repeated here. Professional kit is well supported by both, but Lightroom has so far been better for offbeat or amateur cameras and lenses. In other respects, it’s not so simple. Lightroom’s RAW conversions are perfectly adequate but unexceptional, while Capture One’s can be stunning. Capture One delivers high sharpness and low noise straight out of the box, together with rich, dense colours. 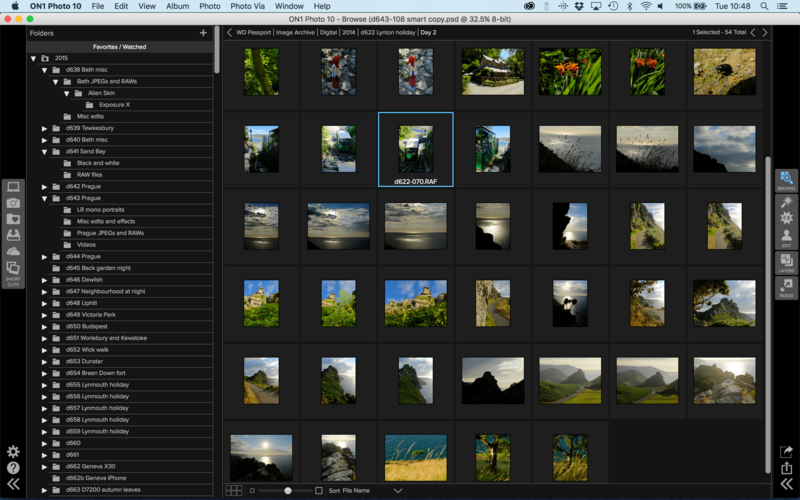 It also offers Lightroom-style local adjustments but with a more straightforward system of layers and masks. Capture One does not offer Lightroom’s mobile imaging capabilities, but it is the top studio tethering tool for countless pro photographers. Lightroom does tethering too, but Capture One’s workflow is tried, tested and trusted, and it’s particularly effective at on-the-fly image adjustments during a shooting session. Indeed, it offers a Sessions workflow with exactly this in mind. 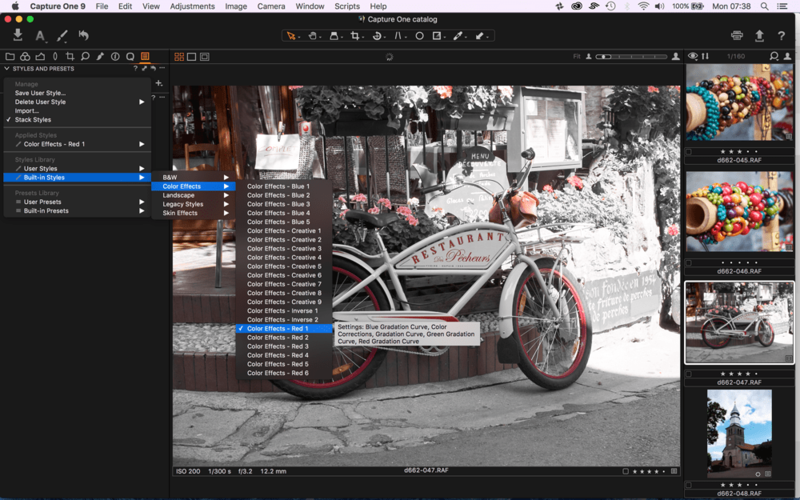 Photo RAW takes an interesting ‘hybrid’ approach to image cataloguing. You can use its Browse module to pick through your image folders individually and then use the Filter tools to find images by label, rating, camera EXIF data, keyword and more. You can also combine filters for more specific searches. But if you want to search across folders you need to Index them first by dragging them onto an Indexed Folders panel. Indexed folders can be searched globally and are updated automatically as you add images. Once the indexing is done, ON1’s system offers a nice blend between simple folder browsing and catalog-style searches. There’s no indexing progress bar, though, and the initial indexing process for a large image collection can take some considerable time. ON1 Photo RAW also offers Collections and Smart Collections, so you can group images together ‘virtually’ without changing their folder location on your computer. These are arranged as a simple linear list, though, and there’s no way to organise them hierarchically in folders. ON1’s RAW Develop tools are workmanlike and effective, but if you want to extract the maximum quality from your RAW files you might be drawn to Lightroom, Capture One or DxO Optics Pro instead. Its hybrid browsing/cataloguing system is effective, though, and it has the added advantage of working with Dropbox and Google Drive Cloud storage. There’s also a Photo Via app for sharing and browsing photos on a mobile device. Alien Skin incorporates a file browser only, with no cataloguing tools. It can still, however, carry out cross-folder searches quite easily and it does this with the option to include images from sub-folders in the Folders panel. So if you have an overall ‘Image archive’ folder, you can select that to see – and filter – your entire photo collection. The filtering tools are relatively basic but adequate. As with most photo browsing and cataloguing tools you can assign flags, ratings and colour labels and you can then use these to narrow down the images displayed in the main window. Exposure X2 can also search metadata like camera EXIF information, captions and keywords. However, this is done via a freeform search field, with no options for narrowing down your metadata search to just one type. You can, however, save your filter settings as presets, so if you keep on using the same search, you can simply select it from a menu. 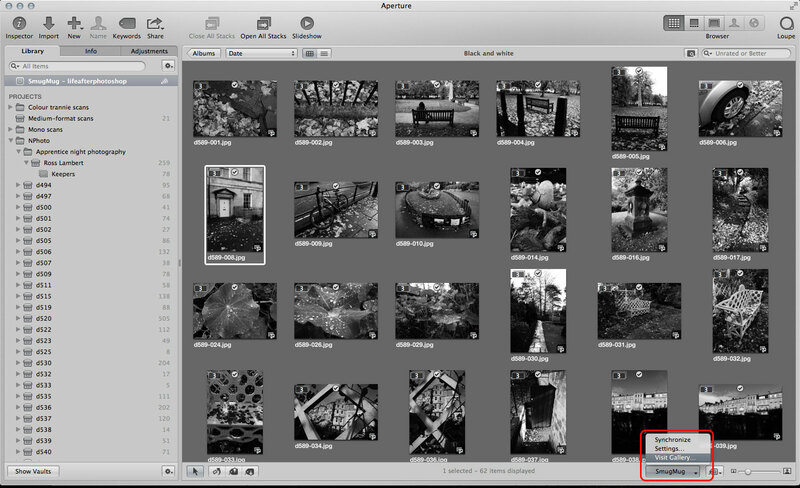 Exposure X2 does have some speedy shortcuts for labelling and culling photos quickly from a shoot, for example, but although it can search for keywords it can’t add them – which is a bit of a surprise. Since there’s no cataloguing system at all, you can’t create Collections or Smart Collections. The filter tools are all you get. Ultimately, Exposure X2’s Folders panel is fast and efficient in its own way and might suit those perfectly happy with a folder-based filing system. It’s a step ahead of Adobe Bridge for cross-folder searching, but it’s still pretty limited as an image organisation tool. 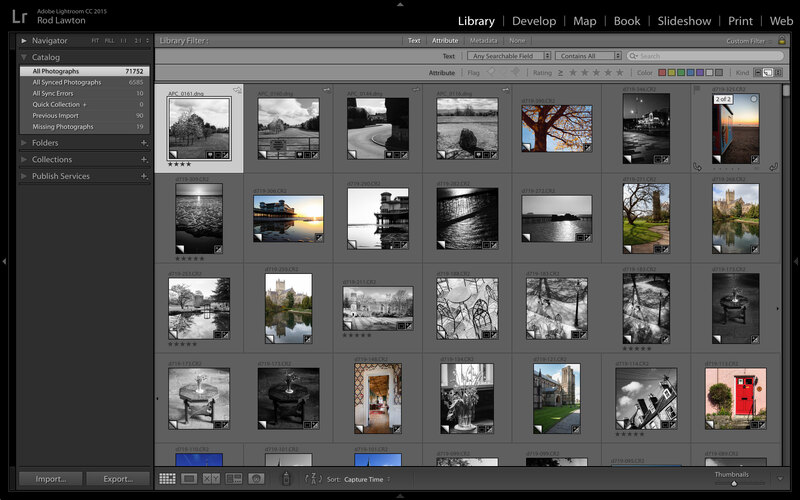 Adobe Bridge ships free with Adobe Photoshop, and it’s practically the definition of a photo browser. It has a Folders panel for navigating around the image directories on your computer, a Favorites panel for adding the folders you use most often for quick access and a selection of thumbnail, filmstrip and other workspace views to suit the way you want to browse, filter and sort your images. 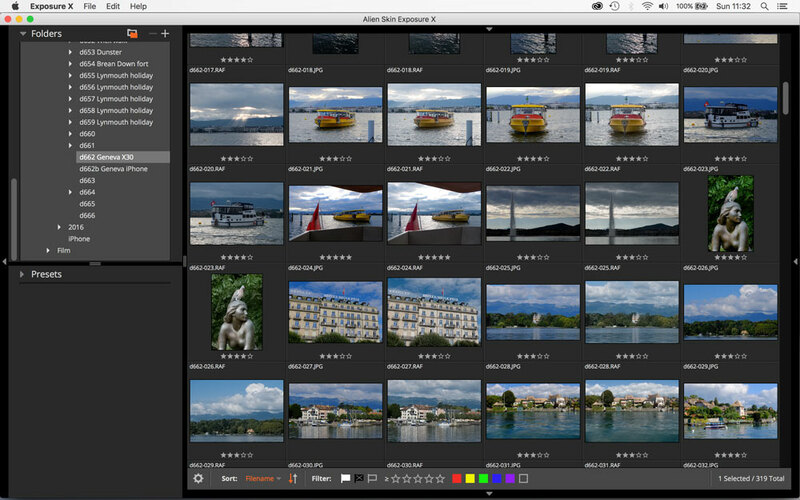 You can use it to display any of the metadata in your photos, both embedded EXIF data and user data like keywords, captions and copyright information, and it can be used to rename, move and even edit your files – you can open JPEGs, TIFFs and RAW files directly in Adobe Camera Raw from here. You can even create Collections and Smart Collections and cross-folder searches – though this is where Adobe Bridge starts to come unstuck. Collections are displayed in a single, linear list – you can’t create a hierarchical filing system – and Smart Collections that search across folders reveal Bridge’s Achilles heel. Once it’s cached previews and thumbnails for the current folder it’s really fast and efficient at filtering your photos, but if you ask it to scan and index a large number of folders you’re in for a long, long wait. Technically, it can do it. Practically, it takes so long you’ll just swap to another program. Nevertheless, if you really do want to keep things basic and you can get all your organisational needs from a simple folder-based filing system, then Adobe Bridge will do the job. Good luck to you. There are a few programs not included in this cataloguing/browsing comparison because I don’t cover them on Life after Photoshop. This is because I stick to programs I would definitely recommend rather than listing every single Photoshop alternative on the market. I am familiar with Corel After Shot Pro 3, for example, but I find its cataloguing tools to be no more than average and its RAW conversions quite patchy. I have similar feelings about ACDSee, even though on paper its feature set looks good (my apologies to both companies). I haven’t included the Organizer app that comes with Photoshop Elements, either, and that’s because while it’s a perfectly good tool to get started with, it’s a bit of a dead end. If you decide to move on up to Lightroom or Capture One, say, you’re going to have to learn a whole new environment. But if you’re a Mac owner, there’s always Aperture. I mention this partly out of mischief, but I am slightly serious. Apple has stopped developing it and selling it, but it still runs on the latest Mac OS and if you ever downloaded it from the App Store, it’s still available in your Purchased section. It’s not too late to get it back! Aperture is Mac only, and it can’t match the editing tools in Lightroom and Capture One, but its Project and Album based image library is simpler and smarter than the separate folders and collections in the other two, and its stacking system is way ahead of Lightroom’s for ease of use, versatility and consistency across folders/albums. It’s a tragedy that Apple has dropped it because, in my opinion, Aperture reached a high point of organisational efficiency, fluidity and versatility that we’re not going to see again. While I appreciate your most balanced comparisons, I feel that you have repeatedly overlooked THE BEST software for browsing, rating, & keywording images: Photo Mechanic. This is a 15-yr-old program (ie, 5 yrs older than Lightroom) that has been marketed apparently without advertising to some 70K users who comprise mostly photojournalists & event (eg, wedding, sports) photographers. Reportedly the developers (who continue to provide stellar technical support as they continue to hone their product through multiple versions) are working on a database function that would enable using the (deep) metadata capabilities of PM to identify images across folders & disk drives. I haven’t overlooked it, I simply haven’t included it. Photo Mechanic is undoubtedly very fast and efficient as an image ingesting, browsing, culling, sorting and metadata tool, and I’m delighted that 70,000 users find it to be exactly what they want. My own company used it for some time until they decided it was no longer cost effective to licence it. I can see how Photo Mechanic would suit a busy commercial photographer who needs to efficiently process and output the images from one shoot before moving on to the next, but it’s not designed to be a lasting searchable archive of images, which was my rating criterion for the article. If Camera Bits (https://www.camerabits.com/) does add cross-folder searching as you suggest then it’ll be a different story, but for now as far as I can see Photo Mechanic, however good it might be, is a regular folder browser like Adobe Bridge. And we’d better hope it’s THE BEST, because it costs $150. What about Macphun Luminar 2018 as a photo organizer? Luminar 2018 does not yet offer any browsing or cataloguing tools. These are not due to arrive until later in 2018, so we’ll have to wait and see.